Find quick answers to common questions about HubSpot's blog tool. How do I change the domain my blog is hosted on? How can I link to a blog author's bio? Can I update my published blog post? How do I change which blog I want my post to publish to? How can I change the design of my Read More button? How can I change the size of the featured image in my HubSpot blog? Can I have more than one blog in HubSpot? Can I set a default blog in my blog dashboard? Can I customize my blog notification emails? Why isn't the comment field appearing on my blog comments form? How are title and meta descriptions formatted for blog tag and author listing pages? Can I add the blog author bio to the bottom of my blog post? Why can't I edit my blog post title in the editor? How can I delete a draft blog post? Learn how to update the subdomain connected to your blog tool in your domain manager. Keep in mind that your product subscription determines how many subdomains you can connect in HubSpot. Your blog author's profile information will appear below the author name on your blog post and in the author bio page. To access the author page, navigate to a live post and click the author's name. Learn how to create and manage blog authors in your blog dashboard. You can edit and update a previously published blog post. This can be useful for correcting typos, updating content, or optimizing successful posts to re-engage your audience. From the dropdown menu, choose the blog where the post that you'd like to edit exists. Hover over the post you want to update and click Edit. Make your changes in the blog editor, then click Update. This will not send new blog notifications or automatic posts to social media. Please note: if you'd like to change the publish date of your post, go to the Publish or Schedule tab before updating your post, then click Change publish date and set the new time. If you have more than one blog in your account, you may want to move a blog post from one blog to the other. Locate and hover over the blog post you wish to move, then click Edit. Click the Settings tab at the top of the editor. Under Post Information, click on the URL dropdown menu to select a different blog. Click Publish to take your changes live. Changing the look of your Read More button on the blog listing page can be useful if you want this button to stand out. Please note that this method requires familiarity with HTML. Learn how to customize the design of your Read More button or edit the text on this button. If you've enabled featured images for your blog, the size of the featured image is set in your coded blog post template. The image size can't be changed in the post editor, but if you're comfortable editing CSS you can set the size of your featured images in the stylesheet for your blog. Please note: if you are not familiar with CSS, work with a website designer to make this change. Click the name of the stylesheet used in your blog. You can see where stylesheets can be applied at the template and domain levels here. Additional blog stylesheets may also be applied in your settings. Add the following code to the stylesheet attached to your blog, replacing WIDTHPERCENTAGE with the desired width percentage. In the upper right, click Create new blog, then add the details for your new blog. 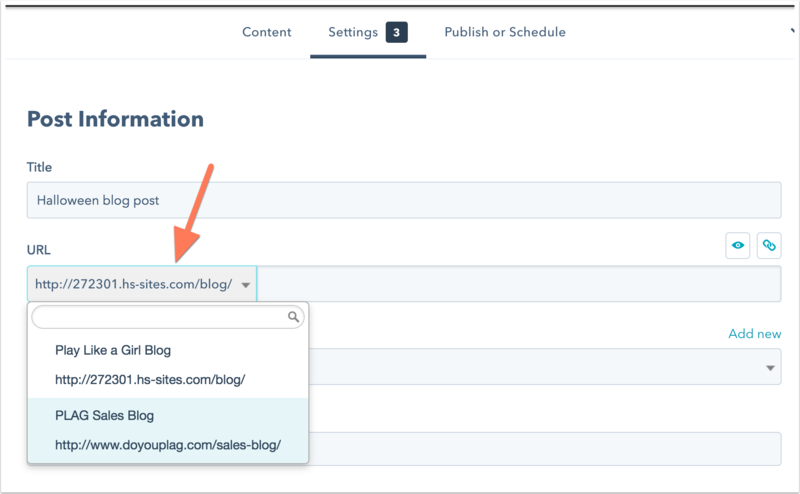 If you're managing multiple blogs in HubSpot, you can select a primary blog in your blog dashboard. Click the blog name dropdown menu to select a different blog dashboard. Click the star icon favorite to set the selected blog as your primary blog. This will be the default blog dashboard you see when you navigate to your blog tool. HubSpot Marketing Hub Professional and Enterprise accounts can customize blog notification emails in the HubSpot email tool. To access these emails, navigate to your settings. Be sure to review your blog subscription form and subscription settings before customizing your blog subscription emails in HubSpot. If your blog comments are enabled and you don't see the blog comment field, you may need to add the Comments field to your form. Click on the [Your blog name] Blog Comments Form to open it in the form editor. If you don't see the Comment field in your form, in the left pane under Add Form Field click Create new. 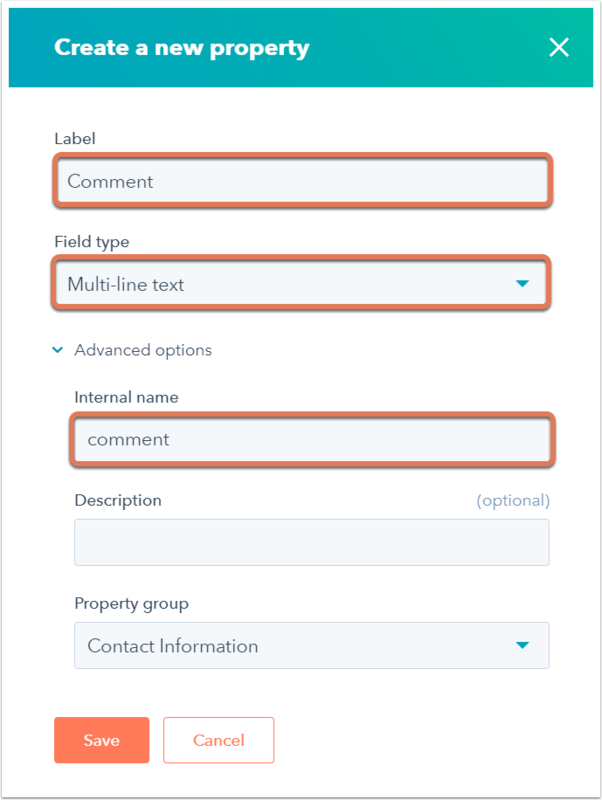 Enter a label Comment and select Multi-line text as the field type. Click Advanced options and check that the Internal name has a value of comment. Click, drag, and drop the new Comment form field to the desired location on your form. Click Save and Publish to take your changes live. For your blog's author pages, the page title will be the name of your blog, then the name of the author. The meta description will automatically be the author's bio. For your blog's tag pages, the page title will be the name of your blog, followed by the tag. The meta description will automatically be set to the tag name, followed by the description you've set for your blog in your settings. Adding the blog author's bio to the bottom of your blog posts involves changing some HTML in your blog template. If you don't have experience with code, work with a designer to ensure that all edits are made correctly. If your blog post html template code is missing Blog | Frequently Asked Questions and you are not sure where to place it in, you may want to contact your designer for their assistance on the best location to place it in the code to accommodate your custom design. Or, you could create a brand new blog template to see an example of what a default template looks like for reference. You can delete a draft or published blog post in your blog dashboard. Alternatively, you can archive the post, which keeps it accessible in the Archive section. In the upper left, use the blog dropdown menu to select your blog. In the left sidebar menu, click Draft. Hover over the draft blog post you'd like to delete and click the More option to the right, then select Delete. In the dialog box, select the Yes, I want to permanently delete it checkbox. Then click Yes, delete post.